Back in the beginning of January I received an e-mail from a former teaching colleague, current Vice Principal, Don Chila. Don works at one of the lucky schools in our district. His school applied for and was awarded a substantial technology grant. Between the technology grant, and monies raised by their PAC, Cindrich Elementary now has over 60 iPads in its school. Don knows the value in using iPads as he sees it first hand in his school. But he wanted to see if he could use them for even more. Don wanted to share. He was looking for a teacher that was either able to come visit his school with some of his/her students, or that he could send one of his teachers and students to visit. With the on going job action this was easier said than done. But Don was determined to make it work. Don put Narinder Walia, a grade 1/2 teacher at Cindrich, and I in contact. Between Don's teaching schedule, my timetable, and Narinder's timetable we figured out that a Thursday afternoon would be the best day for a visit. Don was going to cover Narinder's class so that she and some of her students could come visit me and my class. Don was going to make this happen. Before Narinder arrived with her students on Thursday Don and I needed to make sure that the iPads would go on line at my school. You see Cindrich is one of the wireless elementary schools in Surrey, but Bonaccord isn’t. Don came by to visit on Wednesday afternoon. Because of where my classroom is situated in proximity to the office airport I have been able to pick up a wireless signal. But with so many iPads in my room the signal wouldn’t be strong enough. We had a problem. As I started to think about things we could do with the iPads but without the Internet Don got in contact with Orwell Kowalyshyn our district helping teacher. Orwell came by my school on his way home and together he and Don brainstormed ways we could make it work. In the end I was able to borrow our laptop cart’s airport because as of Wednesday night no one had signed out the cart for Thursday afternoon. I was given required information in case we had trouble getting the iPads on line, but for the most part I was ready for my visitors to arrive at 11:30 the following morning. Thursday morning my students were pretty excited because they knew we were going to have a lot of iPads in our classroom. After recess we headed to our school lab to work on our individual blogs and Storybirds before returning to the classroom just before 11:30. My class was a little excited and a little nervous for our guests from Cindrich to arrive. Shortly past 11:30 Narinder Walia, along with her SEA and six of her students arrived in my classroom. They brought along with them 16 iPads. 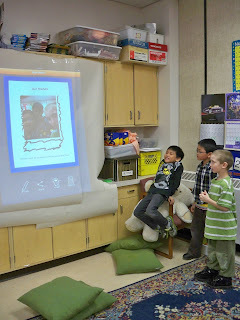 We quickly got the children settled and partnered them up with students from my class. Then we handed out the iPads. For the first part of the visit Narinder and I felt it was important for the children to explore the apps on Cindrich's iPads. Narinder's students were so keen to share with my students, and my students were so excited to learn from them. Narinder and I observed it all as our students were being kids. The excitement level rose, but so too did the learning. The children were learning and sharing with one another, using the iPads as their common ground. This free exploration session passed by quite quickly as it was soon time for lunch. My students took really good care of our visitors as they headed outside to play, then returned a bit later to eat. 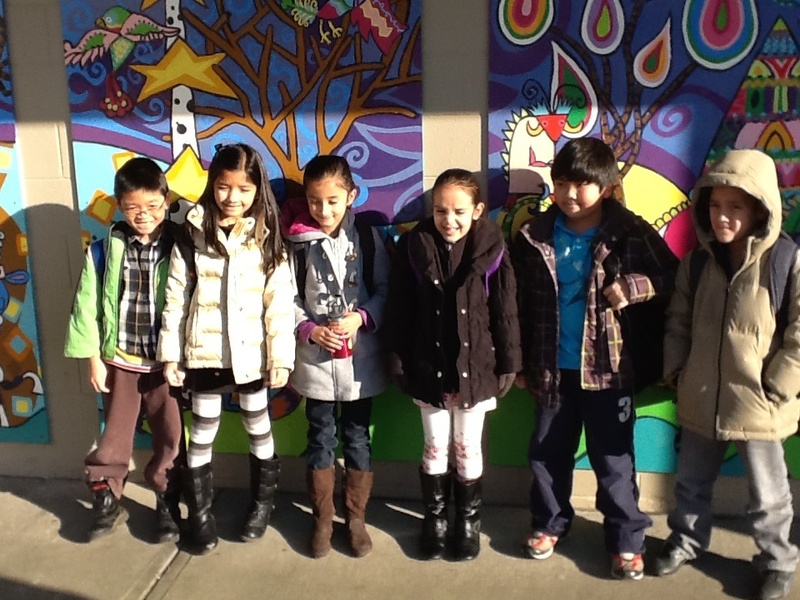 My students were excellent ambassadors for our school. During the second part of the visit Narinder and I felt it was important to have the children officially collaborate together on a project. 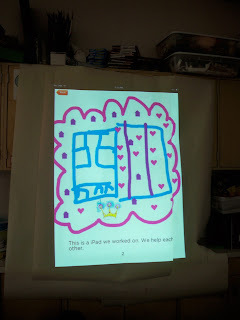 On Wed. evening she and I took a look at a few story writing apps and decided to use Scribble Press. Scribble press is great because it's easy for primary students to use. There are story frames already on the app or you can create your own stories. 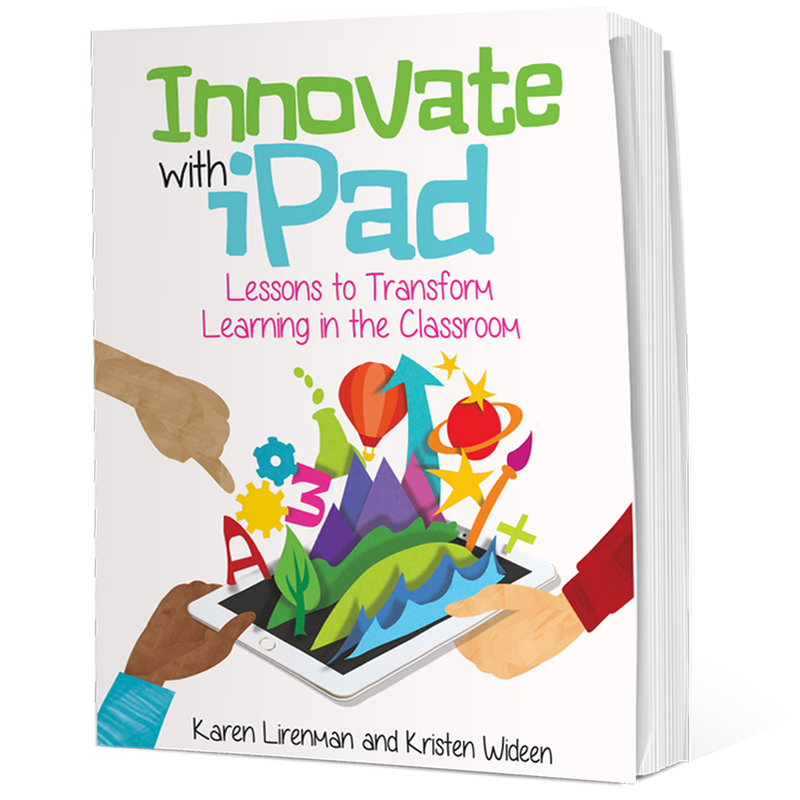 With the app you are able to add photos, drawings, stickers, and text to create books. The task was to create a story around the experience of working with children from another school while using an iPad. Narinder demonstrated some of the basic features of the app. At this point we realized that the power in this collaboration wasn't so much that everyone had their own iPad, but that each group had Cindrich and Bonaccord students in them. Since there were only six students from Cindrich visiting this time three children shared each iPad. 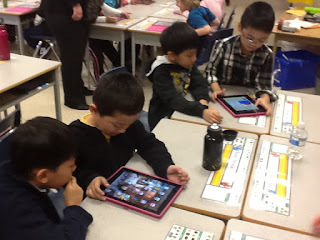 Right away the classroom filled with a buzz as the students explored the app. For my students it was the first time many had used the camera feature on the iPad (yes, it IS something I will be exploring more with my students). There was excitement as projects were being created. Narinder and I moved from group to group helping when or where it was necessary. As the session wrapped up it was important for us to come together and share our projects with one another. I think everyone was impressed with what they had completed in the short amount of time that they had. It was obvious to see how this collaboration project had accomplished even more than we had expected. Much, much more. One of my favourite pages shared was made by three young ladies. In case you can't read the words at the bottom of this image it reads, "This is a iPad we learned on. We help each other". What powerful words they have written. So yes, this was a very wonderful experience for everyone involved. Again none of this would have happened without the support from Don Chila, Vice Principal at Cindrich Elementary. In addition a special thank you goes to Orwell Kowalyshyn for helping us out in a pinch. He has again gone above what is expect in his role to help me out. So where do we go from here? First off I'll do whatever I can to get Narinder to teach with me at my school. Her positive energy was wonderful and I loved her manner with all the students. But, the likely hood of that happening isn't very high as I think she is quite happy at her school. So the next option is to get support from either my administration or her administration (or both) to let this happen again. If we weren't in job action I'd think that she and I would probably make it a monthly event, where we visit each others schools with our entire classes. The collaboration between us as professionals has been great, and between the students even better. There was a real connection. So my question is, have you ever done this with the students that you teach? Besides in school buddies, or global on line buddies, have you ever actually buddied up with another class in your local school district? I'm curious to hear. 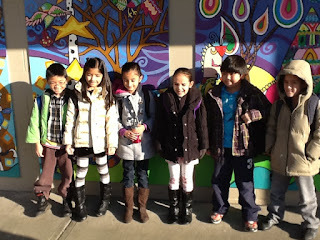 If interested I have also blogged about this experience on my class blog. You can find it here. 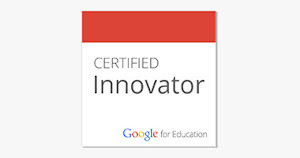 It is so wonderful to see people going above and beyond to enhance the learning experiences of their students. The I-Pads are a wonderful learning tool that engages students as 21st century learners. Will your next visit be to Cindrich? This is incredible, Karen! I love seeing the students working and learning together. This really shows the value in collaboration! Aviva it was an excellent experience and I hope we'll be able to do it again soon. I'm thinking next time we'll go to them and then the third time we'll meet right at our school board office! So exciting. Hugh, if job action wasn't an issue we'd be there next week but things are a bit more complicated because of it. Narinder and I will do what we can to get both of our entire classes together again soon. Collaboration at it's best!! Thanks for the inspiration!